The Nero Multi Trigger is a hardware triggering device for your DSLR camera or flash. It is similar to the Trigger Happy and Triggertrap Mobile iPhone apps I have reviewed, except it’s a stand alone device. The Nero Multi Trigger has 10 built in functions, and of the ones I was able to test, it does them all well. That said, there are a few downsides to the Nero Trigger. The Nero Multi Trigger comes nicely packaged in a cardboard box containing the trigger, a cable to connect the trigger to your camera and an instruction manual. Don’t lose that manual, though, you’ll need it! The trigger itself contains an on/off switch, a flash output port, a camera output port, a button to change the mode (M), a button to change the active function (C), a wheel to select the sensitivity and a display to show the function and sensitivity level. Lightning Trigger: Uses a built-in optical sensor that will trigger the camera or flash when it is tripped. Sound Trigger: Uses a built-in microphone to trigger the camera or flash when a sound of a certain volume is heard. The sensitivity is configurable via the dial on the side of the unit. Sound Trigger with Lock: The same as above, except it will only fire your camera or flash once, and then pause until you tell it to listen for sound once again. Time Lapse (1-10 secs): Uses a built in timer to trigger your camera at a specified interval between 1 and 10 seconds. Time Lapse (1-10 mins): The same as above, but the interval can be set between 1 and 10 minutes. Laser Trigger with Delay: Uses the built-in optical sensor to detect a laser and then trigger once the laser beam is broken. The delay is the amount of time before the camera or flash is triggered. It can be between 0 and 500 milliseconds. Laser Trigger with MultiShot: The same as above, but instead of setting a delay you set the number of times the trigger fires the camera or flash. You can set Nero to trigger between 1 and 10 shots. Long Exposure: This mode will trigger your camera (set in bulb mode) for exposures between 30 seconds and 4 hours. Super Bulb: This operates similarly to a standard bulb trigger. You press the (C) button once to start the exposure, then once again to stop. Manual Trigger: This is like a standard remote trigger, except on steroids. You chose how many shots to take (between 1 and 10) and when you press the (C) button the Nero triggers your camera the number of times you set. Due to time constraints and “Superstorm Sandy” hitting New Jersey I wasn’t able to test as many of the functions as I wanted to. Of the two “specialty” functions I was able to test, it performed well, and I was impressed with the overall speed of the trigger. I’m really looking forward to trying out the Lighting Trigger mode when summer and it’s thunderstorms roll in. I used the sound trigger to photograph balloons popping. I hung a water balloon from a broom clamped to two chairs and set the Nero to sound trigger mode and level 5 sensitivity. I connected the Nero trigger via the flash output to my Canon 580 EX II set to 1/64 power. I then used a sewing needle to pop the hanging balloon which created a loud enough sound to trigger my flash. The results were pretty cool, but unfortunately I overwrote the memory card containing the images, so I have nothing to show for it. Within the next few weeks I should have some time to recreate the set up and re-take the lost shots. When I do I’ll edit this post to include the images. To test the laser trigger I purchased a 5 mW red laser from eBay for $2. I set up the laser on a stool and pointed it toward the optical sensor on the Nero trigger. I then connected the Nero trigger’s flash output to my Cactus v4 wireless flash trigger which was set to trigger my two flashes: a Sunpak 383 on 1/8 power with a red gel pointed towards the back wall, and a Canon 580 EX II at 1/64 power positioned on a light stand at camera right. After everything was set up I stuck a bowl of milk on a box and then started pouring more milk through the laser beam and into the bowl. The results are a little underwhelming… this is not as easy as it other people make it look! A few things to improve upon for next time: better pre-focusing, a better angle and maybe some different colored liquid or a non-white bowl. As mentioned earlier, the Nero Trigger does have a couple of downsides. None of them are too great, but they are something to consider if you are in the market for a triggering device. First, you need to keep the manual handy, at least in the beginning. The Nero Trigger only has a simple display with only 10 lights. Unless you memorize the function and optional sensitivity setting each light represents you’ll have hard time knowing exactly what you’re doing. A simple one- or two-line LCD panel would work wonders here. Second, you need a screwdriver to change the batteries. I don’t know about you, but I don’t keep a small screwdriver with me in my camera bag. If I were out in the field using the Nero Trigger and the batteries died I wouldn’t have a way to change them. I would, quite literally, be screwed. The Nero Multi Trigger is a very capable and full featured remote triggering device for your DSLR and/or flash. It does have its place among the other hardware triggering devices, like the Triggertrap v1. It isn’t quite as convenient as Triggertrap Mobile, or other triggering apps for smart phones or tablets, for example, but it does have several key features which separate it from the pack. You can learn more about the Nero Multi Trigger on their website, follow them on twitter, like them on Facebook or find them on Flickr. You can buy the Nero Multi Trigger directly from Nero, on Amazon or from a variety of other worldwide retailers. Shortly after posting my review of the Trigger Happy Camera Remote I was contacted by the one and only Haje Jan Kamps (a.k.a. the photocritic) to write a review of his new product, Triggertrap Mobile. In return for an honest review I would be given a free copy of the Triggertrap Mobile app and and a free Triggertrap Mobile dongle. I happily agreed, and a few days later the dongle was delivered to my front door. Triggertrap Mobile is a descendant of the Triggertrap v1, which is an Arduino based hardware camera triggering device. The TTv1, for short, was a successfully funded Kickstarter project that I had watched grow from an idea to a real, shipping product. With the success of TTv1, it was a natural progression to try and harness the power of the various environmental sensors built into today’s smartphones and tablets. Leveraging these sensors would mean the ability to have a less featured, but still quite powerful, camera triggering system. Triggertrap Mobile does this exceptionally well, and at a price point that is sure to please just about everyone. The Triggertrap system, both v1 and Mobile, work by sending audio pulses over standard stereo cables. Due to the nature of stereo audio having two channels (left and right), Triggertrap is able to leverage that ability into providing two different triggering channels. By default one channel is used for triggering the autofocus, and one channel is used for triggering the shutter, however you are able to customize and change the parameters of those channels to trigger other devices (flashes, for example). Triggertrap Mobile, much like Trigger Happy, is a two part system, consisting of an app (either paid, or free) for your smartphone or tablet (currently only iOS is supported, however Android support is planned), and a hardware dongle that goes between your device and camera. One of the benefits of Triggertrap over Trigger Happy is that the dongle is camera independent, which means, if and when I decide to upgrade my camera, all I have to do is get a new, relatively inexpensive, cable to go between the dongle and my camera. * = modes that are only available in the paid version of the app. Of the 13 triggering modes, while I did experiment with all of them, I was only able to fully test and produce results for a handful of them in the two week time limit I gave myself. Program: Put your camera in any mode, press the button and it takes the photo. This is the only mode that works with the internal camera. Bulb: Put your camera in bulb mode, press (and hold) the button and then release the button to stop the exposure. Timed Bulb: Put your camera in bulb mode, press the button once to start the exposure, and press it again to stop. Manual: Put your camera in bulb mode, set the exposure length on the app, and press the button. You can only create a exposure with a 1/10s or slower shutter speed. The bang mode triggers your camera (either the internal camera, or the external camera) when a configurable decibel volume is picked up on the devices internal microphone. You can configure the dB level to trigger as soft as -40 dB, or as loud as -0.1 dB. Using this mode I was able to configure one of the channels to trigger my flashes to do some high speed photography. In the following result, I had set myself up in a dark room with a bucket, a spoon, a strawberry and a cup of milk. I set one of my flashes to 1/8 power, covered it with a blue gel and pointed it at the back wall. My other flash was set to 1/64 power and pointed directly at the spoon containing milk. My camera was set to take a 2 second exposure at ISO 100 and an aperture of f/6.3. Triggertrap Mobile was set to trigger my flashes (not my camera) when it heard a sound over -20 dB. 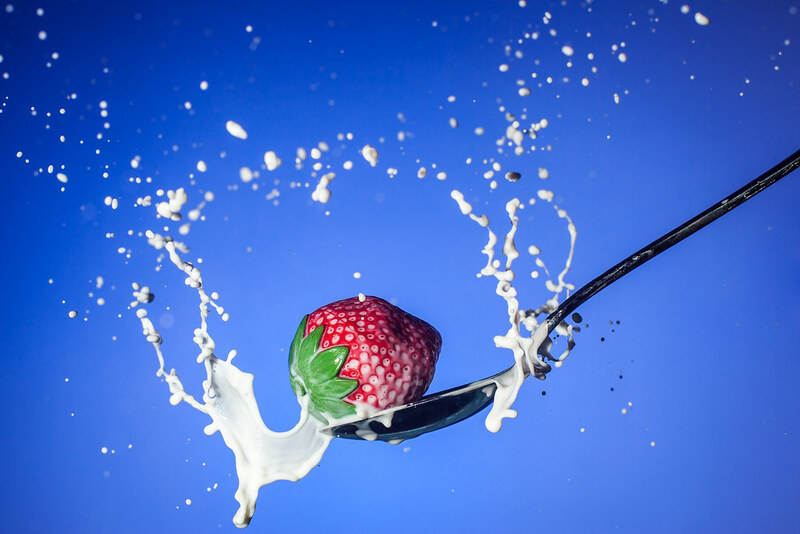 The sound of the strawberry hitting the spoon was enough to reach this volume, thus triggering the flashes. Just prior to dropping the strawberry I would open the shutter of the camera. The 2 second shutter speed had a negligible effect on the overall exposure since I was doing this all in a dark room. The timelapse mode turns your device into an intervalometer and can trigger either the internal camera or one connected via the dongle. It features 2 sliders, one to set the number of photos and the other to specify how long you want to take photos for. There is also a handy sunrise and sunset tool built right in. Eased timelapse mode lets you vary the interval between shots, thus giving the appearance of speeding up or slowing down time. This mode has several functions for easing the time in or out. The first, and most gentle ease is called “Quadratic” and the final, and most aggressive ease is called “Sine”. Check out the video on Triggertrap’s website for examples of each easing function. Eased timelapse mode can trigger the internal camera, or an external camera connected via the dongle. Distance-lapse mode lets you trigger either the internal camera or an external camera based on a configured distance. This trigger uses the devices internal GPS antenna to calculate distance travelled. You can configure the app to use either metric or imperial units. In this example I set up my iPhone 4S on a windshield mounting bracket and set Triggertrap to take a photo every 150 yards. The resulting 15 second video gives the impression that you’re travelling a constant rate of speed, despite travelling on roads varying in speed from 25 MPH to 65 MPH. Seismic mode uses your devices internal vibration and shock sensor to trigger the internal camera or an external camera hooked up via the dongle. This mode seems to be the most sensitive, and as a result the most useless. Event set to the maximum value my phone is constantly being triggered. Perhaps my phone is defective, or I just live in a highly seismic area. Peekaboo mode uses your device’s internal camera to trigger either itself or an external camera when it detects between 1 and 5 faces. This handy feature will effectively add facial recognition to any camera, as long as you have it point in the same direction as the camera you are triggering. In reality, it’s probably easier said than done, however if setup correctly it could produce some interesting results. Star Trail mode does exactly what it says, it helps you take photos of star trails. Instead of using one hour long exposure, it will take a series of shorter exposures that you can then blend or stack to make your final image. As a result of using this method your final image will have less noise. Unfortunately, I was unable to test this mode as I live in a densely populated area with too much light pollution. LE HDR mode can be used to create Long Exposure HDR (High Dynamic Range) images. This mode can only be used to trigger an external camera. It is important to recognize that this mode will only work in Long Exposure HDR scenarios. The reason being is that Triggertrap Mobile can only reliably trigger an external camera at shutter speeds as fast as 1/10s. If you’re shooting during the day, and you can’t get your shutter speeds that low, there are a few ways to try and get around this limitation: set your ISO is as low as your camera will go, increase the aperture of your lens, or use a neutral density filter. In a bind you can try using a circular polarizer, however it won’t cut out as much light as a ND filter would. In those mode you can take between 3 and 19 shots to be combined into an HDR. The app is smart enough to know what the maximum and minimum number of exposures you can have based on the middle shutter duration and the number of stops you have selected between exposures. LE HDR Timelapse mode is exactly like LE HDR mode, except there is an added “Between sets” slider to tell TT Mobile how often to trigger a new set of exposures. The major difference between the LE HDR Timelapse mode and the normal Timelapse mode is LE HDR Timelapse mode is missing an option to set the total number of shots you want to take. Instead, you have to press a “stop” button while the app is taking the shots. I can understand why, but it might make a good feature enhancement to be able to say “I want to take X number of HDR images”. Then, the app can go and compute that for X number of exposures, multiply by the number of HDR images desired, and then take that total number of exposures. Tesla mode uses your device’s internal magnetometer to detect changes in the magnetic field around your device. Like the Seismic mode, this mode is little too sensitive to be used for many things. The information screen suggests you could make this into a door alarm by placing a magnet near the door and then it would trigger as the door was opened. Any magnet I tried was too powerful and pinned the needle at the right side of the screen. As a result I wasn’t able to do any real experiments with this mode. Motion mode uses your device’s internal camera to establish a baseline scene, and then it can trigger either itself, or an external camera when it detects a configurable amount of change in that scene. I had initially tried using this particular mode to trigger my strawberry photo above, but due to the lack of light in the room my iPhone was unable to detect any appreciable change, or motion, in the scene. Bramping, or Bulb Ramping, mode can ramp your exposure up or down during a time lapse sequence. This is useful when creating time lapses of a scene that has changing light situations, like sunrises or sunsets. I did find a bug in this mode, however, which is the help screen says this mode can only be used to trigger an external camera, however there is an internal toggle on the main screen. Triggertrap Mobile is the mother of all camera triggering systems for mobile devices. It is fully featured, cheap and it works wonderfully. I would certainly recommend this system over any other triggering system for mobile devices. You can get more information about Triggertrap Mobile on the Triggertrap website, buy the dongle from their store or Amazon, and download the app from iTunes (free, paid). You can also follow Triggertrap on Twitter, Facebook or Google+, as well as join their Flickr group to submit your Triggertrap creations. Earlier this year I saw a neat little Kickstarter project for the Trigger Happy Camera Remote. It instantly piqued my interest as I am a fan of time lapse photography and it is something I enjoy doing. I didn’t hesitate making my $50 donation to the project to get early bird access to the special cable that would be required to go along with the freely available software for iOS or Android. Last week I finally received this missing piece of the Trigger Happy system, the “Trigger Happy Unit”. This would finally mean that I could dump my hacked TI-83 calculator as an invervalometer. While the TI-83 was cool, it also drained batteries very quickly and it’s timing mechanism wasn’t exactly accurate. For example, 5,000 TI-83 cycles equaled approximately 3 seconds, which would slowly increase over time as the batteries drained. The Trigger Happy system appealed to me for several reasons: the software ran on my iPhone, which is a device I have with me nearly all the time; if I was near a power source I could plug in my iPhone, thus my only power bottleneck would exist at the camera; I could control the interval as well as the shutter speed from my iPhone, where previously I could only control the interval from the TI-83; I could start doing HDR time lapses and bramp time lapses. The Trigger Happy Unit, which is a short, meter length cable with an embedded signal processor. This is what goes in between your camera and your device. The Trigger Happy App, which is available for iOS and Android devices. Since the Trigger Happy Unit is a cable, there isn’t much I can do to review it, other than to say it’s a cable, and both ends fit properly into my camera (a Canon EOS Rebel XT) and my device (an iPhone 4S). The folks at Trigger Happy do have cables that fit a wide array of cameras and manufactures, including Canon, Nikon, Sony, Pentax, Olympus, Samsung, Kodak and Fujifilm. As for the app, well, that’s a different story. As of this review, I don’t believe the app is feature complete, or well tested. I will break the app review into three categories: The Good, The Bad and The Ugly. Simple Remote Trigger: Press the button, take the shot. Bulb Trigger: Press and hold the button, take the shot for the duration of the hold; or press once to start the exposure, press again to stop. Intervalometer (for Time Lapse): Set the interval (the time between the shots), set the duration of the time lapse (in hours or minutes, or unlimited) and set the shutter speed (as fast as 1/30s or a slow as 24 hours). HDR Mode: Supposed to be able to do up to 9 shots and 16 stops of dynamic range. Bramping: Also called “Bulb Ramping”, which is useful for making time lapses that go from day to night, or vice-versa. Unfortunately, the good of the app is relatively short. The app launches reliably, and the bulb trigger feature works. The Standard time lapse and Bramp time lapse features also work as described. The HDR portion of the app crashes for me on my iPhone. I can set the Interval and Duration, but as soon as I try to set the HDR parameters (Exposure Interval, Number of Shots and Base Shutter) the app crashes. Every. Single. Time. There are many interface and usability issues that I believe are preventing this system from being ready for prime time. Erroneous information diaglogs: When setting the Interval to “off” or the Duration to “unlimited” informational messages still appear. For example, setting the Interval to “off”, going back to the Time Lapse screen, and then going into the Interval screen once again yields a message stating “A photo will be taken ever 6 seconds”, despite the Interval being set to “off”. Similarly, when going from Subsecond back to Normal the informational dialog still shows the subsecond shutter duration, despite the “1 second” duration being selected on the screen. Shutter length messages: When subsecond shutter speeds are selected the information message says the duration in seconds and milliseconds. As a photographer I don’t think in milliseconds, I think in fractions of 1 second, ie- 1/30, 1/4, 1/2, etc. I believe the app should use language that makes sense to photographers. No memory: The app doesn’t remember the last settings you used for the time lapse interval, duration and shutter length. Every time the app launches the default values are displayed (interval: 6 seconds, duration: 1 hour, shutter length: 1 second). Lack of a Simple Trigger: The Trigger Happy website touts a “Simple Trigger”, however I can’t seem to find this feature in the app. The only two trigger systems I see are bulb related: press and hold, and touch to start and stop. To me, a simple trigger means I can can use any of the auto or semi-auto modes (Program, Aperture Priority & Shutter Priority), connect the cable to the device and have a standard remote cable release. That is, I press the button, the camera calculates the exposure and the shutter is released. As it operates right now the camera must be in Manual mode, and the shutter must be set to bulb. In fact, I couldn’t get the shutter release portion of the app to work at all unless the shutter was in bulb mode. What sort of review would go over The Good, The Bad and The Ugly without including a sample of what could be done? Here’s a time lapse of my two year old twins during playtime. This was captured over the course of one hour using an interval of 3 seconds and a 1 second shutter speed. Overall, I believe the Trigger Happy Remote has some serious potential, however there are just a few problems with the app getting in the way. The current price on the Trigger Happy Unit is $49.99, and it is expected to go up to $69.99 once production is ramped up. At this stage of the game, I do not believe the Trigger Happy Remote can demand that price. That said, I am happy with my purchase and I understand that a majority of these problems are probably due to being an early adopter and using immature and untested code. I have total faith that the developers of Trigger Happy will get the kinks ironed out and this will become the de facto invervalometer and remote triggering system for iOS and Android devices. You can find out more about Trigger Happy here, purchase a Trigger Happy Unit here and get support for Trigger Happy here.